Would you believe this is doable in 15 minutes? These little morsels make the perfect bar snacks, hors d’oeuvres or small plate appetizers, and best of all, they’re addictive. Fair warning: once you see how easy they are, you’ll probably want to make a double batch … one for you and one for your guests. * In the pic above and below, there’s an assortment of olives, from Kalamata olives, to Niçoise olives, to Sicilian green olives. Any pitted olives will work for this dish, even Moroccan oil-cured olives. ** This can be plain breadcrumbs seasoned with sea salt, black pepper and chopped fresh herbs of your choice. I like minced fresh parsley, fresh oregano, or fresh lemon thyme. Place beaten egg in a small bowl. 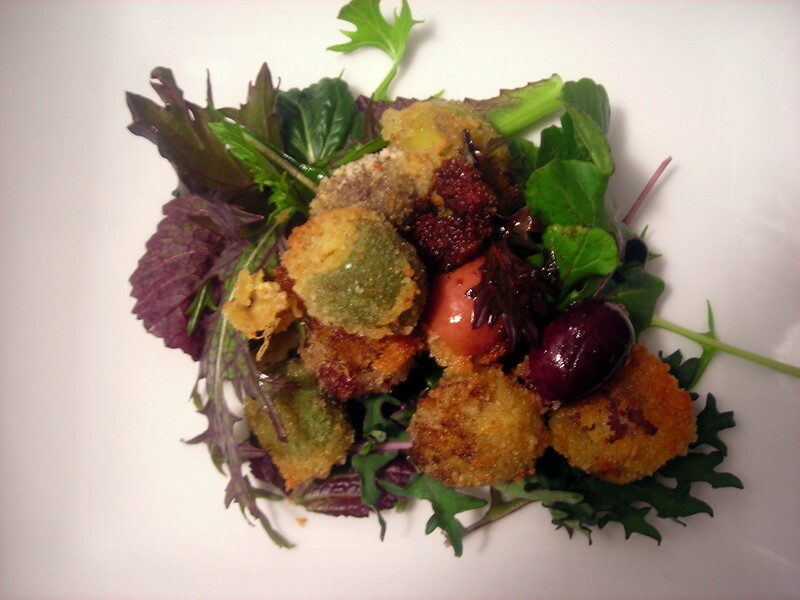 Dip the olives in the egg, then coat in seasoned breadcrumbs. Heat olive oil in a large skillet over high heat until the oil begins to shimmer. If the oil has begun to smoke, you’ve waited too long. Fry the olives in olive oil until golden brown. Lift the olives with a slotted spoon and place on a plate lined with paper towels. Repeat process until olives are all fried, then serve at once. The picture shows some baby mesclun that I had in the fridge. 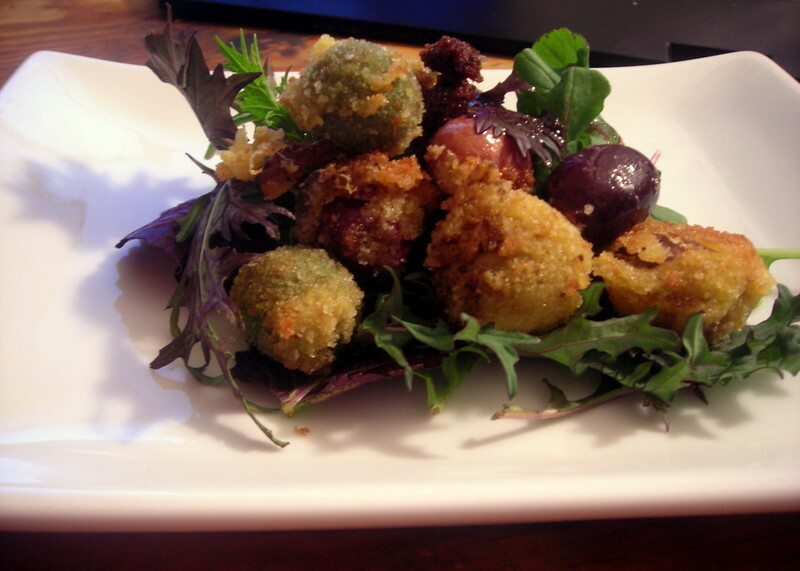 You can serve the olives in a salad as pictured, or by themselves. 22 Dec	This entry was published on December 22, 2012 at 3:42 pm. It’s filed under cooking, food, food photography, recipe, vegan, vegetarian, winter and tagged appetizer, food photography, olives, recipe, Spanish cuisine, vegan, winter. Bookmark the permalink. Follow any comments here with the RSS feed for this post. what a great idea, this !